Yellow is the color of sunshine, of brilliant warm summer days. It is the color of bananas, lemon meringue pie and butter pecan ice cream. There are beautiful yellow breasted birds and wondrous yellow flowers. Some cultures view yellow as the color of happiness, amusement, and even optimism. 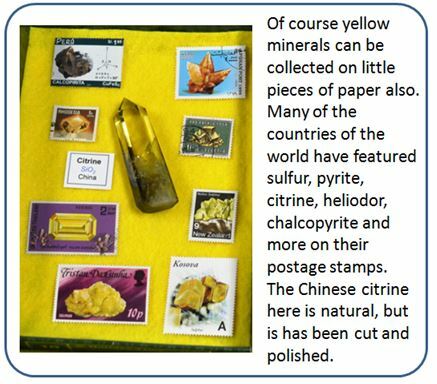 All that is well and good, but yellow is also the color of wulfenite, sulfur, heliodor and a number of other wondrous minerals and gems. And, of course, it is the color of gold. 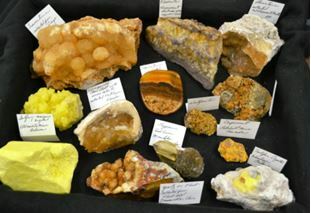 It was with this appreciation of the color yellow that WCGMC convened in November for a celebration of “Yellow Minerals”. 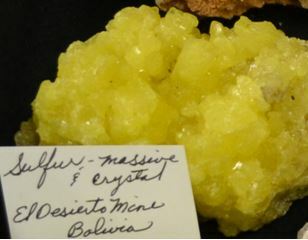 The quintessential yellow mineral is undoubtedly native sulfur. The simple native element mineral is the definition of yellow, no color modifier is needed. Linda Schmidtgall’s sulfur was the largest and brightest of several that were brought to the event. Sulfur is a common element in the earth’s crust, but it is usually combined with oxygen in minerals like gypsum or with metal elements in minerals like pyrite. Sulfur is a common element in volcanic gases and native sulfur can form in vugs and along fractures in volcanic rocks, but the best sulfur crystals form when sedimentary gypsum deposits are reduced (oxygen stripped for sulfate). Linda had more than sulfur to display. Travertine from Ilion may not be classic yellow, but it counts, and it is pretty. In Arizona, PbMoO4 is love! And sometimes this love is yellow. The square thin transparent crystals are also quite fragile. This secondary mineral in lead-rich ore deposits requires an arid environment to form and be preserved. Morocco and Mexico are other locations where colorful wulfenite can be found, but the mineral was discovered, and named, after a location in Slovenia in eastern Europe. 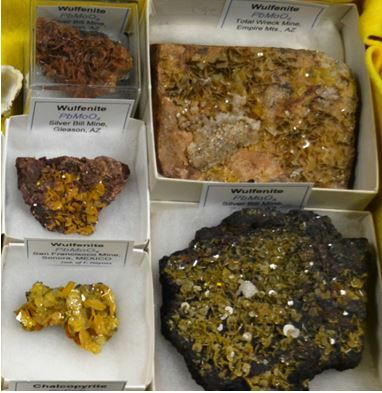 Four of the five wulfenite specimens I brought to “the show” were self collected in Arizona. 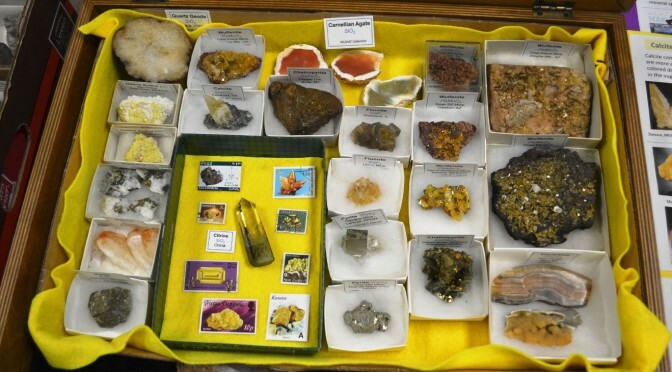 You can spot the sulfur in the upper left and probably the honey colored dogtooth calcite in the middle of Stephen Meyer’s display, but can you see the gold? Here let me help you out ! 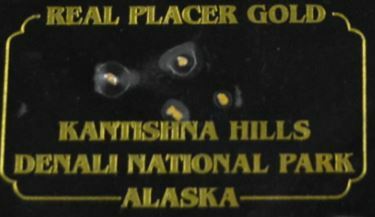 Of course, there were other yellow metallic minerals on display. Chalcopyrite and pyrite are often referred to as fool’s gold, but they remain collector favorites. Pyrite is cubic and chalcopyrite is tetragonal and both show off these forms superbly. Two inch chalcopyrite specimen from China from my collection. 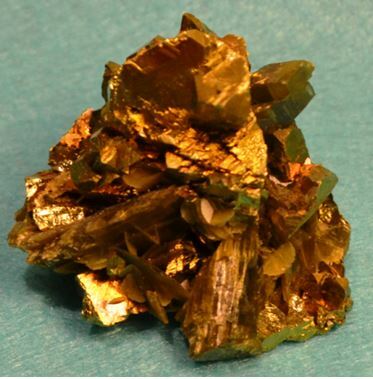 Ed Smith had a nice pyrite specimen, but he also brought a number of faceted citrine crystals. 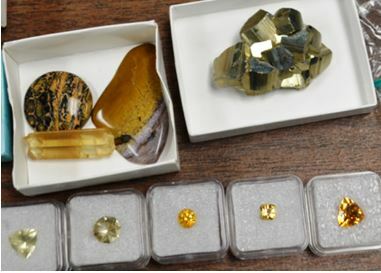 In addition to gemstones like citrine and heliodor, there is a lot of lapidary material that comes in shades of yellow and orange. The club has a bit of Carnelian agate which tends to best display its brilliance once cut. Carnelian agates from the club collection. 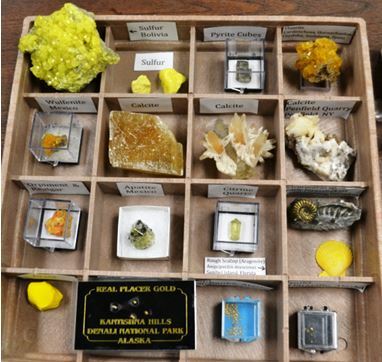 Some minerals don’t show off their spectacular yellow colors without a little help. Scapolite comes to mind. 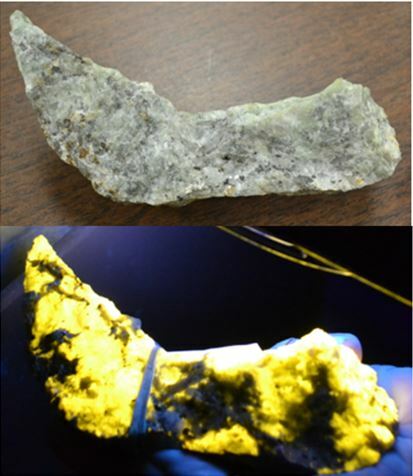 Typically a drab grey, bluish grey to beige mineral when found in the metamorphic rocks of the Adirondacks, most scapolite lights up canary yellow when exposed to long wave ultraviolet light. Bill Chapman brought this drab massive block of scapolite (Var. wernerite) to the event. You had to go into the back room with his black light to see its special color. 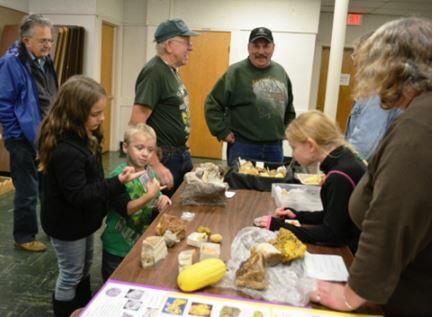 Gary Thomas collects fossils and he was not going to be left out. I think this specimen has been doctored a bit though. You know, I don’t think we even bothered to check whether his paint was fluorescent! Generally we do not think of fossils when we think of the color yellow. There are, however, yellow pyritized fossils. We collect them at Alden every year, and several were on display from Club members. 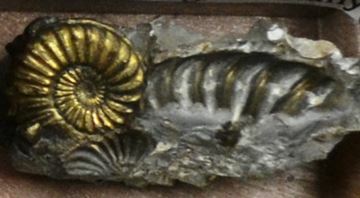 But, this excellent pyritized ammonite is not from Alden and it is not Devonian. It is not even from North America. Stephen Mayer displayed this Pleuroceras sp, which is from the Early Jurassic of Germany. 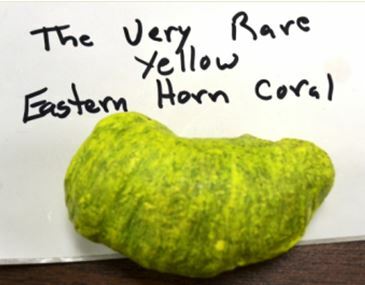 All this and now yellow smithsonite, no yellow fluorite, no arsenic minerals like orpiment and legrandite. But it was certainly a fun night in Newark, NY. Previous PostIndian CreekNext PostAce of Diamonds for Stromatolites?